Okay, so, we begin this week with the Egg comp, you know the one I’m talking about where they have to transport eggs with their fingers through chicken wire, but in THIS Egg comp, they have to roll the eggs down a plank once they get to the “end of the maze” to knock down the letters H, O, and H. And there’s a “Have” container and I hope I don’t need to explain that to anyone. And there are eagles that come crashing down on top of their cages every so often. SO, James and Natalie are really fightin’ hard for this one because 78 minutes before the Eviction they learned that Paul was not the target and that Corey would be voting out Michelle – because Michelle hasn’t come to talk to her, not once all week. What a big, steaming pile of crap. She says that no one has talked strategy with her, but then says that Paul has been talking game with her then says something about no one being able to trust anything anyone says at this point. Cut to the Bathroom later where Natalie is telling James that she KNEW working with Nicole and Corey was a bad idea, then Nat tells Michelle that she needs to talk to Corey. THEN, back in Tokyo Corey confirms to Michelle that yes, she is the target, but he’s down for whatever, but he’s just having his girl’s back, and blah blah blah. Nicole joins and Michelle makes it clear, as everyone else leaves, that if she stays, as a fan of the show, she’s going after Victor and Paul because they are strong players, Nicole tries to say that she’s trying to do what Corey wants to do and lol Nicole calls Corey back into the room and he does some back peddling and we end the segment with Michelle telling them that they are crazy if they don’t think Paul’s a threat. Back to the HoH comp and I promise, I will not be making any egg puns. I think we’ve all heard enough. So Corey makes a go for the Have container and Nicole does NOT like it because she thinks it will be portrayed to the rest of the HGs that she and Corey think they are sitting comfortably and one should NEVER feel comfortable playing Big Brother and OMG… Nicole seemed pretty comfortable lounging, and who really knows what else, in bed with Corey all summer, but that’s none of MY business… After an hour, everyone except James has knocked down their O then Corey takes the lead by scoring an H, then Victor scores an H, and BLAH BLAH BLAH! Victor wins HoH, but it’s a very close race. After the comp the group calling themselves “the Final Four” celebrates in the Have Not room while James and Natalie, in the Bathroom, know for a fact that they are going to be put up on the block. Even though Victor was NOT Natalie’s target, she put him up, and James voted him out sooo yeah. Next, Paul and Corey mourn the kidnapping of Pablo the Pelican and how rude and uncool it was for Michelle to kidnap Pablo as she exited the house. Later, in the Storage room, Paul and Victor talk about their journey as #SittingDucks; they’ve been targets since the beginning, but they are still there and they plan on going to the end together. Even later, up in the HoH, the Four are joking around about small town life, teasing Nicole a little. Hey, girl. My class was 66 kids and my younger brother, 11 years younger, only had 33 graduating in his class so yeah, I totally know small town life and all of the jokes the boys are making are hilarious! By the way, there is only ONE traffic light in my county and it’s a blinking red light. Sooo, later, on the balcony, James and Natalie are sad pandas because they know they are being nominated. Natalie knows it was not a good decision to trust Nicole and Corey, she was trusting James, they betrayed Victor and Paul, and now they are wheelin’ and dealin’ with the people that told Natalie to put them on the block! James says no use crying over spilt milk, but as you probably know, Natalie does NOT stop reminding James that she didn’t want to pair up with Nicorey… Natalie is also pretty sure that she’ll be joining the Jury this week, says she’s going to use the Veto on James if she wins it, doesn’t know what she’ll do without her best friend regardless of where she is come Thursday. At night, we get to watch Corey talk in his sleep for a bit; it’s hilarious. He keeps saying Harry Potter, Potter and lol it’s so funny. James and Natalie have a moment talking to each other from separate beds about how she likes him because she likes him, another cut of Corey sleep-talking about Harry Potter, then we get to see Nicole and Corey in bed the next day talking about keeping whomever stays, James or Natalie, that they need to keep that person close, but stick to the boys and be upstairs a lot and blah blah blah. Later, James talks to the boys upstairs, confesses to forming a Final Four with Nicorey, and lets them know that Natalie had nothing to do with the decision to evict Victor and – Nicole and Corey walk in so this conversation is done. James leaves the room and Nicole asks what they were talking about, Victor tells her, and she’s immediately in damage control mode, but there is no reason for her to be at all concerned because as far as Victor is concerned, any deals she had previously are water under the bridge. She and Corey kept him and Paul safe last week, trust has been shown, they gave him $5,000 so it’s all cool and crescent fresh. Downstairs, James tells Natalie what he talked about upstairs, that he basically threw himself under the bus so she could stay, and blah blah blah, it’s nomination time and of course, Victor nominates James and Natalie. After the Nomination ceremony, James and Natalie are obviously upset about being on the block together and in Tokyo, in bed with Corey again wearing that yellow sweater, Nicole asks if she should feel guilty because she feels bad. In the DR, she’s having a bit of an emotional breakdown over James being nominated because he’s a really good guy and she’s not happy about him being on the block; she’s just happy that it’s not her and Corey sitting in those chairs. Later, James and Natalie are playing dominos at the kitchen table and she says something about it being fun being on the block with him, Paul overhears this on his way to Tokyo and he immediately tells the Four about it. She’s so confident that she’s staying, he says. Paul doesn’t like it and he regrets that she was told she is a pawn; Victor points out that what he said is what he said, but he doesn’t control the votes sooo… The Veto must be won by one of them so they can maintain control of the situation. Later in the UK room, Natalie brings up again that she didn’t want to trust Nicole and Corey, she’s kicking herself for not putting her foot down and a very calm James just sits and listens because, like, it is what it is and in the DR, he is becoming a little annoyed that Natalie keeps bringing up the issue. Sometime else, in the Bathroom where Nicole and Corey are doing hair stuff and stuff, Natalie is also doing hair stuff and asks Corey if Victor still has orange juice, he does, so Natalie announces that she’s going upstairs for orange juice. What she REALLY wants to do is apologize to the boys for betraying them, she was trusting James, sometimes you let the wrong people influence you, you betray the people that actually have your back… The boys tell her thanks, but in the DR, Paul is suspicious. Natalie has always played all innocent and says she doesn’t know how to play the game, buuut… Paul’s impression is that maybe she does know how to play because it seems she just threw her ride-or-die, James, under the bus. Downstairs, Nicole is checking the fridge and yuuup! There’s orange juice very conveniently located inside the fridge in the kitchen; she and Corey know what Natalie is up to in the HoH room and Nicole does not want to be around Natalie next week. Back upstairs, Natalie thanks the boys for their time and leaves the room; Victor and James are shocked that Natalie just threw James under the bus, they haven’t even played Veto yet! They thought she’d at least wait until after the Veto… As soon as the HoH monitor confirms that Natalie is not close by, Paul signals to Nicorey to come upstairs. Where’s Natalie? In the UK room telling James exactly what she said to Paul and Victor, but she doesn’t realize how they have interpreted her words. Back upstairs, Paul and Victor are filling Nicorey in on what just happened with Natalie, they are shocked at the assumed notion that she just threw James under the bus and they really aren’t sure who to evict this week. Time for the Veto and this is such a cool comp. It’s all MacGyver themed since ya know, CBS is remaking MacGyver and needs to promote the show, and this is how it works. There are three rooms that they have to MacGyver their way through to win the Veto. In the first room, they have to remove a manhole cover using pipes that have the same shape as the locks on the manhole, this allows them to go through a tunnel into the next room. In the second room, they have to find a key to unlock the door to the next room. They have a chain, length of wire, pipes cut in half to direct a flow of water from a big water container to a grate in the floor that has a key with a floating device attached to it. In the next room, they have to launch balls with a catapult over a fence and into container to stop some “explosion”. A random draws gives Natalie the opportunity to set the time bar and she does a pretty good job! Nine minutes and six seconds is the time to beat and until someone does, Natalie is the holder of the Veto. And she gets to watch everyone else compete from the HoH room AND she gets to eat pizza! Next up, Nicole aaand BOOM! She fails to stop the explosion in time, doesn’t even make it to the third room. Victor is next and he makes it to the third room, but BOOM! He joins the girls upstairs. Now it’s James’ turn, but he totally fails because he doesn’t realize what to do with the water until it’s too late and he doesn’t have anymore. Corey is next Nicole doesn’t have much hope because she doesn’t think Corey is good at these kind of mental comps, but he ZOOMS through this and takes the Veto from Natalie with a time of six minutes and 14 seconds. As Zingbot’s TOP Secret Service agent Paul is -BOOM! 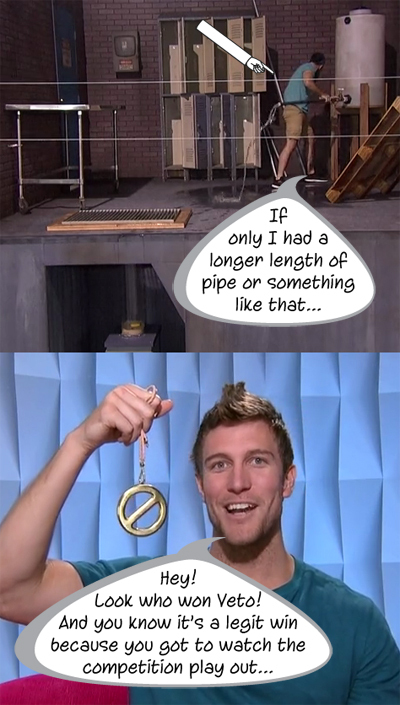 Corey wins the Veto. So after the comp, the Four celebrate in the HoH room and OF COURSE Corey is not going to use the Veto – Nicole would go up on the block! Downstairs, Natalie is happy that she got second place, and probably happy that she’s not covered in soot from the “explosion”, and she’s pretty sure she’s going home this week. They know she’s good at comps. James says he won’t let that happen. He’ll do what he has to do so she stays. Back up in the HoH, the Four talk about who they should evict. Victor wants James to go, but Natalie’s recent game play is making him consider shifting the target to her instead. She’s smart, and Paul thinks she’s hiding something because of how defensive she gets, even when you give her a compliment. Back downstairs in Tokyo, later, James has a chat with Corey in which Corey drops some hints that James might be staying. Corey feels a lot closer to James than he does Natalie and he would like to make sure their friendship stays on good terms so he can pull James closer if Natalie goes to Jury. James pleads to Corey to let Natalie stay, but Corey says they, the people voting, will do what’s best for their game; James can relax. Even later, in the UK room, James and Natalie are playing dominoes and he wants to tell her that Corey hinted that she is the new target, but he doesn’t want to rock the boat since she already blames him for being on the block in the first place. So as they play dominoes, Natalie starts asking questions. Did he throw the Veto? Does he have a Final Three deal with Nicole and Corey? James says he should know him better than that. Then she says that if he sticks with Nicole and Corey if she leaves that he shouldn’t ever talk to her again. It’s his fault she’s in this position and it is because of her trusting James trusting Nicole and Corey and she’s going home for it so if he works with them, she will never speak to him again. James is crushed by this and he’s beginning to question Natalie’s intentions and true feelings for him. 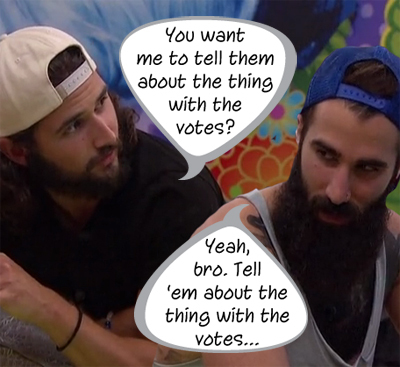 Upstairs, Victor and Paul are discussing the vote. If they keep James, he’ll probably target Nicole and Corey; they’ve never really betrayed James and they have this tidbit of info regarding Natalie throwing him under the bus. 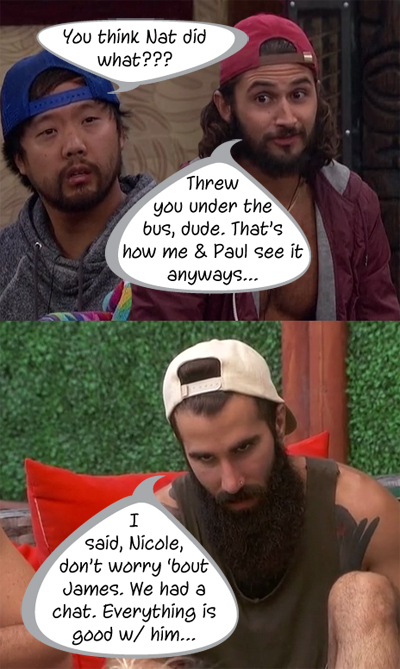 Paul calls James up to the HoH and the boys tell him their interpretation of their previous chat with Natalie – that she threw him under the bus. James is shocked, but Natalie did tell him everything he said to those boys, and James isn’t sure if Natalie said what she did maliciously or not, but he tells the boys he won’t say anything to her about this conversation. He heads back downstairs to get in the hot tub with Natalie. She notices how sad James is, but he tells her it’s “nothing” and it is time for the Veto ceremony and Corey does what he said he would do and he does NOT use the Veto. Either James or Natalie will definitely join the Jury this week. After the Veto ceremony, it is made very clear to those of us watching that there are only three votes this week, Nicole’s, Corey’s, and Paul’s. In the UK room, Natalie reminds James AGAIN that they should not have trusted Nicole and Corey, it was the dumbest game move, they should have stuck with the people that got Paulie out and blah blah blah. James keeps a level head, it is what it is, and cut to the Backyard where the Four are playing dominoes and considering the votes. Corey can’t see himself evicting James. Paul and Victor tell Nicorey about their conversation with James, but he plays it down so Nicole doesn’t get suspicious, but she is suspicious. Later in the Backyard, James is playing pool with Victor. When Natalie heads back inside, Victor asks if things between him and Natalie are okay, he says there’s tension then Natalie returns so the conversation ends. Victor heads back inside and he asks all casual-like, what’s up and she says all cheery that nothing much is up then he tells her that people can tell there is tension between them and blah blah blah – a back and forth begins between them. Indoors, the Four are watching. Later in the evening, Corey joins James on the exercise bikes and James opens up to him about how things are between him and Natalie, how it’s his fault they are on the block and one of them is going home since he wanted to work with Nicole and Corey and blah blah blah. 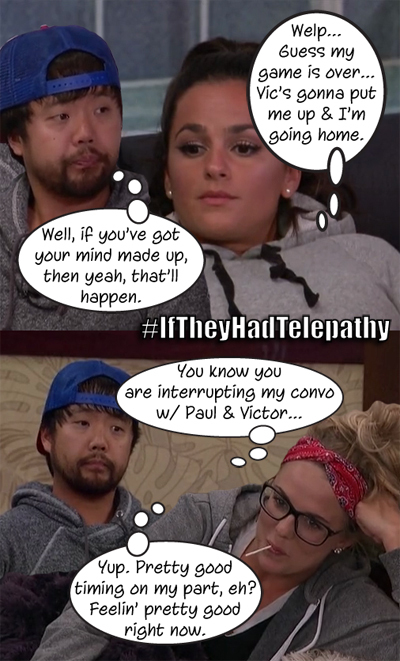 In Tokyo later, Corey tells Nicole about the conversation and he’s really fed up with Natalie putting all the blame on James, who’s head is totally not in the game right now because of that “brat”. Cut to later that night in the UK room where James and Natalie are getting ready for bed. James want to sleep in the bed with Natalie since eviction day is looming, but she wants to sleep alone. And she’s so excited for Thursday. She’ll get to meet Julie. She can’t wait to go to the Jury house. And she saying all this in a sweet voice, but in my opinion, she’s being a jerk. James shares my opinion and tells her that she’s being an @$$hole and bratty; she laughs. He says something about her true colors coming out now then he says that he heard that she threw him under the bus as he’s walking towards the door. This makes Natalie sit up in bed. He reiterates that it was PERCEIVED by others that she threw him under the bus, says he didn’t believe it to be true, but now when they have only a day and a half left, she just wants to do her own thing and that makes him question her motives. She asks if he really thinks she was using him and he’s all, gee, well, let’s look at the evidence. She tried to get with Victor, that didn’t work out. She has a crush on Corey, but that didn’t work out for her either. Then there was her little fling with Paulie, that she kept secret. Natalie says she never had a fling with Paulie, that she’s always had James’ back, but James isn’t letting her off that easy. They have a day and a half left to spend together and this is how Natalie’s acting? She can’t believe he’s saying these things and neither can James. He leaves the room, everyone else is in Tokyo, and he tells them he’s done. He was ready to throw himself under the bus for her, but not now. Next up, Julie talks to Jeff and Jordan about the marriage and the baby, it’s a boy and it’s a very cute little segment, but doesn’t relate to the game so if you want more info, watch the episode again at the CBS site. After Jeff and Jordan, we get to see Michelle join the other Jurors; they are disappointed that she’s there and are shocked while watching her week in the house. Then it’s time to vote, after James and Natalie give their speeches, Julie starts calling people into the DR to vote and it’s unanimous in favor of keeping James in the house. Natalie has been evicted this week. And the HoH comp is the fill the container comp. They have to transfer butter from a barrel down the slippery lane and they can fill a smaller container first to get a larger butter scoop. So this one isn’t ending during the episode… So that’s all for this week! Sorry to see Natalie go because I’d rather have seen her and James go to the end together than Nicorey, but whatever. Good job, Natalie! HEY! Don’t forget, CBS is shifting our BB days to make room for Thursday night football. For the rest of the season, our BB nights are Sunday, Tuesday, and Wednesday! Thanks for reading, ya’ll! EDIT: A good friend of Your Reality Recaps is looking for his cousin who went missing on September 2, 2016. If anyone reading has information regarding her whereabouts, please contact the authorities and share the link provided on your social media platforms. THANK YOU! Previous Article#BB18 Week 11 Recap Show With Bronte D’Acquisto!